India’s largest multinational flexible packaging materials and solution company Uflex Limited has recently launched a Collar Type Twin Head Four Servo Driven Form-Fill & Seal (FFS) Machine. The versatile machine is much in demand by packers and brands alike for packing granular materials and powders with unmatched ease and efficiency. Designed and manufactured indigenously by the Engineering Business of Uflex at its plant in Noida (India), this machine has two heads for forming and filling pouches of different types and sizes. The four servo system coupled up with a vacuum belt helps significantly reducing rejection rate owing to the perfect alignment and movement of the laminate. The machine is equipped with a control panel placed in the centre of both the heads, enabling tremendous ease of operation by a single operator. The machine requires lesser space, electricity and maintenance as compared to two separate machines performing equivalent work, there by economising the operating costs. Furthermore the machine is fitted with a new design of blade that ensures quality perforation between pouches with well contoured notches offering immense ease of tear-opening to the end-users. The especially designed operating programme for the control panel paves way for a user-friendly human machine interface (HMI). The machine can form and fill up to 110 pouches per minute depending upon the product to be packed, quantity to be filled, laminate structure and thickness and the filling system used. This machine forms pillow type pouches with a central seal and is ideal for packing extruded snacks, pulses, rice and spices among other products. The filling weight can range between 10gm to 1kg. Commenting about the features of the new Twin Head Four Servo Driven Form-Fill & Seal Machine [UFLEX-CT4SD Twin (SLIM) Bagger], Uflex Limited president and CEO of engineering business Mr Ajay Tandon said: “This machine appropriately addresses the pain points faced by the customers in terms of higher rejection rates of formed and filled pouches. “Owing to its four servo drives and the vacuum belt, the alignment and movement of the laminate is very smooth and perfect, thereby significantly reducing the rejects. Further, the seal integrity that the machine offers is of high quality enhancing product safety and customers’ satisfaction and delight. “Ease of handling, optimal space utilisation on the shop floor, work flow flexibility and optimised operational costs all put together make this machine a great value for money. We recently exhibited this machine at PackEx India 2016 in Mumbai and the response was absolutely terrific. “The order pipeline is very strong and encouraging. Given the advantages that the machine has to offer, customers looking at capacity expansion or replacement of the erstwhile single head FFS machines are placing orders for the new Twin Head Four Servo Driven Form Fill & Seal Machine. 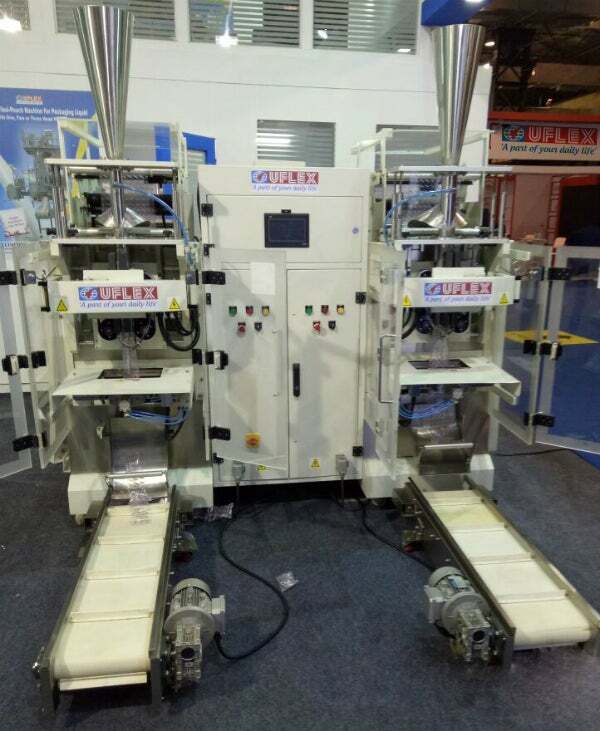 Amid strong demand for the machine, Uflex Limited chairman and managing director Ashok Chaturvedi said: “The New Twin Head Four Servo Driven Form-Fill & Seal Machine is a classic example of value engineering by Uflex. Upholding our ethos of continuous improvisation of products and processes we have engineered this machine offering immense flexibility to our customers for packing variety of products.